What if your church or your denomination's official publishing house used denominational funds to print, publish and promote a book that extols the joys of rejecting biblical authority. That's right, rejecting the Word of God. This is exactly what many biblically sound Nazarenes are now experiencing. 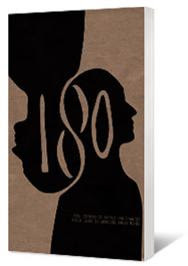 180 is a compilation of several authors, including Emergent leader and author, Leonard Sweet, Frederica Mathewes-Green (who, along with Sweet and Emergent godfather, Brian McLaren, contributed to the book The Church in the Emerging Culture: Five Perspectives), G.P (Graham) Taylor (author of Shadowmancer), and Baptist-bred biographer-turned-fiction-writer, Ace Collins. A few of the other contributing authors include Emergent youth speaker, Mark Oestreicher, Karen Spears Zacharias, Patricia Raybon (who has endorsed contemplative spirituality and favors Catholic mystics), Cameron Conant and Bob Buford, the founder of Leadership Network, (the suspected genesis point which spawned today's Emergent movement and its original leaders). Buford also served as the initial chairman of the Peter F. Drucker Foundation for Nonprofit Management, now known as "Leader to Leader Institute." How does a fundamentalist become less conservative? What makes a person intent on marrying choose to remain celibate and enter the priesthood? How can a scientist give up believing in certainty? What makes an organ-playing pastor's wife hit the road with a band and her bass guitar? These are all intriguing questions, sure to bring people into a fuller, more holy walk with Jesus, right? Conant's chapter explains how he began his adult life as a conservative but when his wife left him he saw the "error" of his Republican ways. Mathewes-Green tells the story of how she migrated from the pro-choice position to become pro-life, which, of course, is actually a good thing. Taylor's part in the book was about how a dope smoking kid got straight - but like the majority of what 180 offers, there is no hint that God, His Son, His Spirit, or His Word had anything to do with the transformation. Another contributor to 180 is self-described "professional adventurer" Melissa Jenks. As a promotional sample of the book, Jenks' chapter was apparently sent to every Nazarene pastor in March, 2010, as a part of the quarterly "Nazarene Communicator." It was because of this mailing that a distressed Nazarene pastor called, making me aware of the book. "I now believe that the Bible is true. Completely true - every single word. "So what's changed? I no longer believe that in order to be absolutely true, the Bible has to be literally true. It doesn't have to mean that earth and life in it were created in seven days. It doesn't have to mean that Methuseleh lived 969 years. It doesn't have to mean that Joshua stopped the sun in the sky or that the streets of heaven are paved with actual gold." Along with promoting feminism and the view that American Christians are a rather hopeless and self-centered lot, Jenks follows with the concept that one can be an evolutionist (like her) and a Christian, too; that beliefs are inconsequential to one's being identified as a "Christian"; and the conclusion that there are many people who reject the historic teaching of the Church but should be unquestionably accepted as real Christians. Whether its called liberalism or Emergent, heretical or just plain goofy, these ideas are surely not within the bounds of authentic Christianity. In fact, as I stated in my March 19th e-update ("Where is the Leadership? "), notions like these more closely relate to the very lie that got us humans into this mess in the first place i.e., "Hath God Said?" (Genesis 3:1). Then comes the book's most regrettable chapter, authored by Nazarene university professor, Karl Giberson. It's called "Giving Up on Certainty," which is exactly what the author tells 180 readers he has done concerning the Scriptures. Giberson is one of the world's most noted proponents of the theory of "Open Theism," (Open Theism hypothesizes that God does not know what the future holds) an evolutionist, and a professor at his alma mater, Eastern Nazarene College. Giberson's chapter in 180 recounts a sad story similar to that of liberal theologian, Marcus J. Borg. He retells how his experience in Bible college led him away from his previously held position of certainty that the Bible was true and gave him in return a profound intellectual uncertainty for the Word of God. Portraying textbook-like postmodernity, Giberson's contribution to 180 amounts to little more than a clear cut, egregious denial of the Bible. He claims to have made this change based on a series of events and teachings he received in college, including an old and baseless charge that assorted prophecies found in Scripture were actually fraudulent. I don't care how intellectual he may be or how many degrees he has, or how many doting peers he may have showering him with awards and prestige. The question needs to be asked: What is this guy doing teaching in an allegedly evangelical school? How many more students will enter once-trusted Bible colleges only to have their minds twisted and their belief in God's Word shredded because someone who does not believe the Bible has been allowed to stand unquestioned before them as an authority? In thinking of the Gibersons and Borgs and other assorted heretics that infest seminary classrooms all around us, I can't help but remember the compelling phrase Jesus used as He addressed the educated but empty hypocrites of His day. Just before calling them snakes, he said the converts of these false teachers become twice the child of Hell than their mentors (Matthew 23:15)! I think I know something of how Jesus was feeling about this topic, but before I allow myself to go there and tell you what I really think, let me introduce a mother named Ann. She has experienced one of the worst nightmares imaginable for any Christian parent. Year after year, Ann trained her son up in the ways of God. When the time came she sent him off to Bible college only to find that some so-called "intellectuals," within the confines of what she thought was a solid theological institution, injected him with the seductive poison of apostasy, obliterating both her own life's work and her son's relationship with God. Thank you for your stand for truth and the defense of the Word of God which is now under attack through the emergent movement. This is being taught as the new post-modern "truth" at many so called "Christian" universities. I have a son who has been captured by this vain philosophy being taught at a Nazarene university. I am praying for his return to the truth of God's Word as he was trained up for 12 years at home and in school to affirm God's Word as absolute truth. The university taught from a New Testament book written by Bart Erhman, a self-proclaimed agnostic and academic expert in textual criticism. That class has derailed my son's faith. I grieve when I hear reports like this. It is heart-wrenching. Hang in there and please let me know how it's going. Remember, you are not alone. There is a godly remnant inside the Nazarene Church who are fighting for your son and for other sons and daughters. Let me know if there is anything we can provide for you or do. By the way, which Nazarene University did your son attend? Thank you for your response. My son graduated 2008 from Point Loma Nazarene University and I also have a daughter enrolled at PLNU finishing her junior year. The university has invited emergent authors/speakers to mandatory chapels and is offering contemplative prayer retreats. I have written the General S/P of the Nazarene organization (Jerry Porter) and also the University president in this regard. The S/P sent me three documents put out by the Nazarenes concerning the emergent church which all clearly emphasized a strong biblical foundation and God's Word as truth. However, the reality of these speakers in chapel and contemplative retreats are contrary to those documents. The University president has not responded. "Even though we're not out to change your mind on anything, we hope to stretch it a little." Stretch it a little? But how? By relying on human stories to emotionally appeal to us that drugs and abortion are evil - but never relating what the Word of God states on the topics? Then worse, by casting doubt on the Word of God with the kind of conflicting, faith-breaking doubletalk found in 180? Call me old-fashioned, but I thought the mission of the Church was to produce materials and teaching that uphold the authentic Gospel of Jesus Christ. Can you imagine Peter, Paul or any of the other Apostles writing a chapter in 180? I think not. God is indeed in the mind-changing business - make that the renewing of the mind through His mighty Word (Romans 12:1-2, Psalm 119:11)! If we need anything today it is voices that refute false beliefs instead of endorsing them. Rather than question marks, we must add exclamation points to the emphatic teachings of the Bible! Call me narrow-minded but I've had it up to my eyeballs with the progressive, supposedly intellectual tripe some so-called Christian educators are foisting on young minds while consistently downplaying and discouraging systematic theology, expository preaching and sound doctrine. It has become a vogue part of allegedly "higher" Christian education today to constantly question and doubt biblical truths rather than uphold them - all in the name of "critical thinking." This isn't some sort of postmodern apologetics. Instead, it is nothing short of subversion and is the very veil with which those who are guided by the spirit of rebellion cloak themselves. I am more convinced with each passing day that what we are battling is nothing short of the attempted complete destruction of the historic Church by some within the borders of our theological institutions and denominations. Just look to those formerly sound theological giants of the recent past, Harvard, Princeton and Yale. Have we forgotten that they were once home to the greatest defenders of biblical truth in the world? It is surely no stretch that one would have to spend considerable time and effort to find many authentic Bible believers within their walls today. We must wake up before their fate becomes ours. Considering the fact that evolution and open theism are being accepted and heralded in Nazarene universities, and books like 180 are being printed and promoted by the official publishing arm of the Church of the Nazarene, make one wonder what is next. However, as most of you know, Emergent heresy is certainly not confined to any one denomination. Concerned Christians should be watching, examining, challenging, and demanding accountability from those in leadership. Lest there be more heartbreak such as Ann's, and for the sake of the next generation, we can do no less. Ladies and gentlemen, TRUTH comes with a price and this is what contending for it looks like.